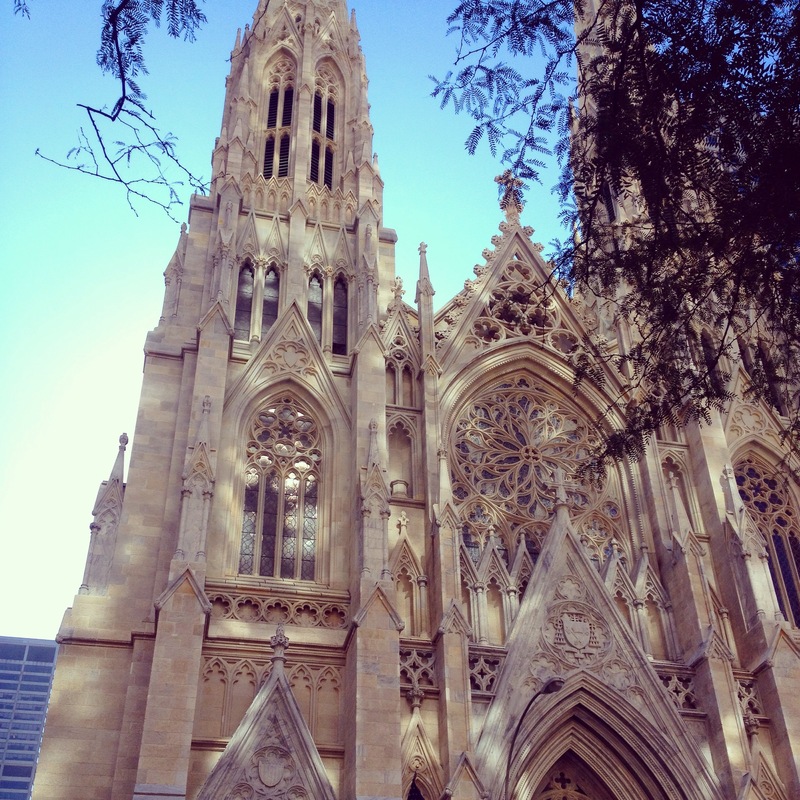 *St. Patrick’s Cathedral, and NO where near where I went today. But isn’t she a pretty lady? Today I was wearing sneakers, riding on a bus through Queens, and Merle Haggard was singing through my ear buds. There is almost nothing in this world more diametrically opposed than urban city streets and old school country. It doesn’t fit. As I was riding, and humming along and doing my best not to belt out “I turned 21 in prison” (because COME ON that is the best song to sing loudly to), I was struck by how much I don’t fit here. Merle definitely doesn’t fit here. But then I looked around the bus. The woman next to me wearing a dozen bracelets on each wrist, her lips lined brightly in fire engine red (slightly smudged on her at-least 80 year old wrinkles). The man across from me was carrying a lunch box and a hard hat. Another was wearing a New York Yankees jersey while tapping out a seriously impressive drum rhythm on his legs. A woman in the back was wearing a purple mini-skirt and yelling into her phone in Chinese. And that’s when I realized I don’t have to fit here. I can keep wearing my sneakers and listening to Hank Williams. I can keep wearing too much makeup and saying ya’ll. Because this is a city of people who don’t fit. I mean, sure. There are absolutely those tv-like New Yorkers who wear crazy expensive clothes and their faces don’t move from too much botox and they are super snooty. But for the most part, most of the people I see are marching to the beat of their own drum. It was a comforting realization, mostly because I’ve never really felt like I fit. Anywhere. I’ve felt out of place and weird a lot in my life. I hide it. I can blend in if I have to, because so often we HAVE to, you know? But riding that bus, listening to classic country, my hair fuzzy from not being fixed and too much wind, I felt like it was finally okay not to fit. Here, fitting isn’t really the priority for most people. Women with bright purple hair, and models who are at least 7 feet tall in their heels (I saw one in real life and was like, “Wow, you’re skinny. And yet huge.”). Men in plaid pants wearing their dogs in a baby carrier across their chests. Guys in suits, and women in heels. People that don’t smile. Crazy people that yell and smile. People who eat strange smelly things on the bus and in the subway cars. Regular moms with kids. Nannies with rich people’s kids. Doormen and taxi drivers and Uber guys standing on the corner (they give me the creeps to be honest). And there, on that a bus, in that moment, I realized that after weeks of trying to convince myself that I like it here, I suddenly actually do like it here. It’s hard. But it’s rewarding. And for those of us who don’t fit well, the relief of realizing that this is a city that doesn’t require fitting… it makes me love it a little. Thank goodness for that. And Merle. I understand completely. And Merle has gotten me through many rough patches. Sounds just like San Francisco. It’s going to take time but suddenly, one day, it will feel like home. Trust. Everybody comes from somewhere (they’re not all from New York, although here in Virginia, it can feel like they are), and for all we know, everybody else feels like the oddball in the group. Sounds to me like you are a regular person, doing normal things, going about your business, fitting in just fine. You’re doing great. We drove from Missouri to the MN State Fair to listen to Merle Haggard and Kris Kristofferson. Sing it out loud girl! I’ve lived in my same town my entire life and can’t imagine how hard it must be to feel like you fit in. Now you know why I live in Portland. Same exact reason. Except no one has botox, there is that. I’m sure it does feel like culture shock! At least they speak the same language 🙂 I agree with some of the other commenters, many of the New Yorkers come from somewhere else. I always thought it would be so much fun (like Marlo Thomas in That Girl) to live in NYC. Hang in there, you will find your groove. Can I just say that I read everyone of your posts but rarely comment and no I am not a stalker! I adore this post and it may have a little to do with your love of Merle. Love your writing. it’s been awhile since i’ve caught up on your posts BUT YOU LIVE IN NYC?! i just tweeted at you because i thought you were visiting and i didn’t want to miss you being in town. and you can call me crazy because i feel like i know you and it’s just because of reading your writing for five or so years. forgive me! This is exactly why I love cities. I grew up in a tiny little town and was far enough outside of the cookie cutter expectation for it to constantly be a super uncomfortable experience. In a few months I am moving to a homogenous suburb and am terrified of losing myself there. I shall be re-reading this again and again.